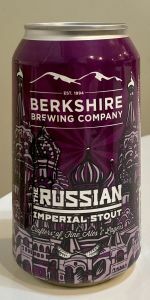 Home Beers Berkshire Brewing Company Inc.
Berkshire Russian Imperial Stout | Berkshire Brewing Company Inc. Very good RIS but just a tad bit thin with the body. May improve with age. Still a good RIS, though. Appearance: Black with an off white, short head that dissipates. Not a ton of lace. Aroma: Vanilla, coffee beans, dark chocolate. Taste: Follows nose. Very nice mix of vanilla and black coffee. Some booze. Very tasty. More flavor emerges as it warms. Mouthfeel: Boozy enough to drink slowly, but not an overpowering beer on the palate. Overall: Very well executed RIS. A delightful cold weather beer. Kicked up a nice head after an aggressive pour. Smell was superb. Taste really struck me as very complex with some nice vanilla notes. Overall a somewhat light Imperial but well worth searching for. Dark as night. Nice 1/2 finger of whitish beige head. Nose is very grainy - roast barley and chocolate malt, and a metallic hint of plum somewhere in there. Flavor is fairly earthy but not overly bitter, giving off a very meat-and-potatoes vibe of no-adjunct-added honest to goodness malt-forward stout. Lots of raw roasted barley, some mild dark chocolate malt, bringing that char and sweetness at the same time, with hints of plum and even a fleeting note of french silk pie every now and again. Semi-sweet chocolate chips rise up to the olfactory at the back of the tongue bringing the nose-palate thing full force. Very nice. Feel could really be improved a lot. It's not silky or smooth or anything of that sort. It's simply a carbonated beer. Some slight dryness on the finish from what I assume is the malt bill, but by and large unimpressive where the feel is concerned. Overall, a decent to good RIS. Lots of better options out there, but I'm glad to have tried this. Near black pour with minimal tan ring of head. Aroma is a mix of roasted malt, vanilla, and a slight grain sour. Fortunately no sour in the flavor, this one's rather sweet with an assertive vanilla component. Fairly thick mouthfeel for the relatively low abv for the style, but very smooth throughout the sip, and a pleasantly non-bitter finish. Pretty good. Bomber pour, its pitch black color with a 1 finger tan foamy head that faded slowly and left good spotty lacing. Label states it's 8.7% ABV. Smells of roasted malts, metallic notes, yeast, cocoa powder, dark fruits, coffee grinds, soy sauce, chocolate and brown sugar. Rich malt notes and chocolate dominate and mask the boozy aspects. Tastes malty with roasted grains, chocolate malt, toffee, cocoa powder, dark fruits, metallic notes, coffee grinds, chocolate syrup, brown sugar, black licorice, faint soy sauce, chalk, mineral water and ashy flavors. The coffee, chocolate malts and metallic notes are strongest, but this manages to flow down smooth with mild carbonation and a thin overall feel. Look: Very dark black. 1 - finger head from a 22 oz. Nice lacing! Keeps a nice foam ring even though the head recedes quickly. Smell: Chocolate and charred wood. Some malt sweetness. Slight plum and raisin. Taste: Slight hop possibly - but more bitterness from the charred black malt. Dry and roasty. A touch of sweetness - malt, caramel, chocolate. Some tobacco, fig, plum, and graham crackers. Feel: Thick, rich, and oily. Overall: A very good brew. Nice balance of heavily roasted grains and sweet caramel flavors. I really did not get any hops, maybe it could have used a touch more. Overall very happy with this one. Berkshire Russian Imperial Stout from Berkshire Brewing Company Inc.